My name is Lewis Gerschwitz and I’m a YouTuber, Video Editor and Graphic Designer based in Adelaide, Australia. Technology and video games have always been huge passions of mine and being able to channel these into my work is why I enjoy doing it so much. I’ve been a YouTuber for roughly 3 years now, currently on contract with Corsair in the US, I mostly create videos using their computer keyboards, mice and headsets displaying lighting patterns or ‘profiles’ that I create. I also do freelance and contract work as a graphic designer and video editor wherever I can. Towards the end of 2014 I had two articles written about my work, specifically my videos about Corsair keyboards as I was one of the first people to start using it as a way to show off the lighting displays (profiles) I was creating. 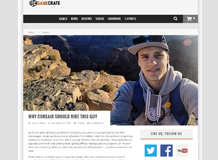 The first article, titled "Why Corsair Should Hire This Guy" gave readers an introduction to my work. 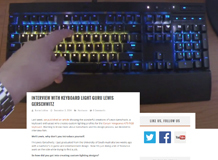 "Enter tinkerer and light-savant Lewis Gerschwitz, who has created a treasure trove of amazing lighting profiles for the Corsair K70 RGB keyboard"
The second article, titled "Interview With Keyboard Light Guru Lewis Gerschwitz" was a follow-up interview I did after the first article. "Wanting to know more about Gerschwitz and his design process, we decided to interview him"
"I have no hesitation in recommending Lewis in working with technology and in customer service. 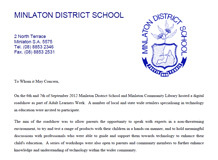 As a site we were highly impressed with his professionalism and understanding and we hope to work with him again in the future." Paired with another student and a real-world client for a UniSA assignment.